An unmarked police truck patrols outside a detention center in Eloy, Ariz. A new report on immigrant deaths in detention centers found that the Arizona facility lacked a suicide prevention plan, despite several recent suicides. 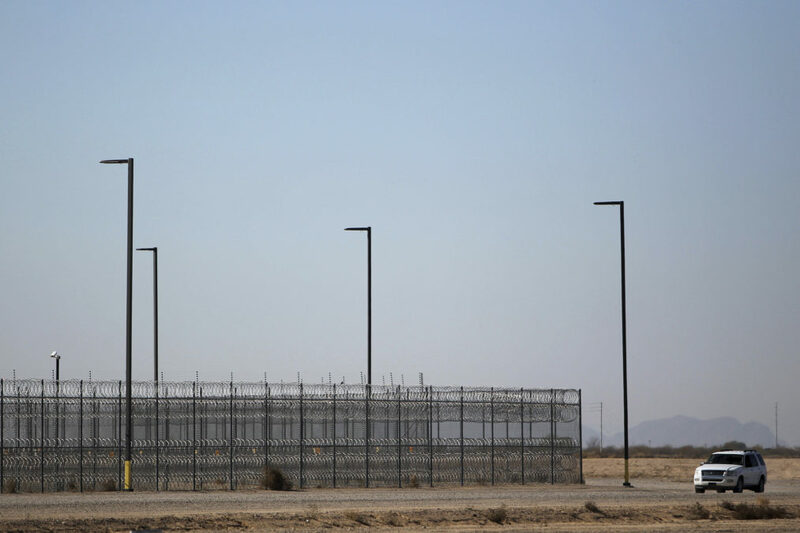 Poor medical care, including underqualified staff and systemic neglect, has contributed to deaths at immigrant detention facilities around the country, according to a report released today by two advocacy groups. The report is based on doctors’ evaluations of U.S. Immigration and Customs Enforcement death reports from 2012 to 2015 and on interviews with people who are or recently were detained in facilities overseen by the agency. Those interviews suggest that dangerous medical systems remain in place today, as President Donald Trump plans to bring even more undocumented people into long-term detention. These include 34-year-old Manuel Cota-Domingo, who died at Eloy of untreated diabetes and pneumonia in 2012, and Lelis Rodriguez, 50, who died in the Rio Grande Valley staging facility in Texas after two weeks without receiving treatment for his high blood pressure. A woman named Tiombe Carlos committed suicide in York County Prison after two and a half years in detention, during which she received “woefully inadequate” mental health care, according to one expert reviewer. At the Orange County jail in New York, a man identified as Luke R., who’d been diagnosed with schizophrenia, had his prescription changed from an anti-hallucinogen to the antihistamine Benadryl, then repeatedly was disciplined for misbehavior. The new report also includes lessons from more than 90 interviews with people who are or were recently detained. They described long waits and language barriers when they needed medical help. CoreCivic/CCA, another private firm, had responded by noting that medical care at its facilities is provided by the Immigration and Customs Enforcement’s Health Service Corps, not the company. “Because we are not the healthcare provider, we do not have access to medical-specific information about detainees,” the company said. The U.S. uses more than 200 facilities to hold people awaiting their day in immigration court. Operations at the facilities vary widely – some are operated by the federal government, while others are run by private companies or local governments under a contract with Immigration and Customs Enforcement. The government maintains four different sets of safety standards depending on the facility. “The problem of poor medical care in immigration detention cannot be separated from the enormous and unwieldy nature of the system itself,” the report says. The report also points to California’s Senate Bill 29 as a promising idea. The bill would end county contracts with private companies to hold immigrants in detention and require county-run facilities that contract with Immigration and Customs Enforcement to adhere to the government’s most recent set of standards. The report also recommends that federal agency stop contracting with facilities with repeat problems with medical care and detain far fewer people who are waiting on court dates. The Trump administration so far has taken the opposite approach. An executive order Trump signed in January calls for detaining more people and building more facilities to hold them. A memo from Homeland Security Secretary John Kelly says parole should be used “sparingly.” And in April, Immigration and Customs Enforcement announced that GEO Group would be building a new 1,000-bed detention center to meet the rising demand. Patrick Michels can be reached at pmichels@revealnews.org. Follow him on Twitter: @PatrickMichels.